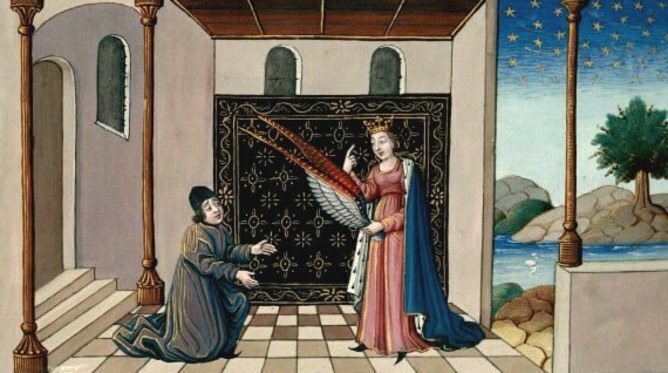 Lady Philosophy offers Boethius wings for his mind to fly aloft. The French School (15th century). • We present next a remarkably prescient article by Ananda K. Coomaraswamy, “What Has India Contributed to Human Welfare?” showing the “application of religious philosophy to the problems of sociology”. It is not sufficient for the English colonies and America to protect themselves by immigration laws against cheap Asiatic labour; that is a merely temporary device, and likely to do more harm than good, even apart from its injustice. Nor will it be possible for the European nationalist ideal that every nation should choose its own form of government, and lead its own life, to be realized, so long as the European nations have, or desire to have, possessions in Asia. What has to be secured is the conscious co-operation of East and West for common ends, not the subjection of either to the other, nor their lasting estrangement. • And to complete our update, a dialogue with biologist Rupert Sheldrake on the idea and place of the soul within the current scientistic materialist worldview. In the modern world, when people talk about the inner life, they mean a life somewhere inside their body and especially inside their brain. Then there’s the outer life which is the whole of the external realm. We’ve internalized this shrunken soul, and think that “the inner” means something inside our brains… The idea that there is an objective reality, totally free from any kind of psychic influence, is an extraordinary illusion. • Our recent affiliation to the PayPal Giving Fund means that now you can contribute to our activities whenever you use eBay. Simply select The Matheson Trust as your favourite charity on eBay by following this link. • Your attention is drawn to a new opportunity to join the acclaimed Sacred Gardens course, a practical and philosophical workshop led by Emma Clark, taking place this year from 4th to 5th June in Wells, Somerset. Please follow this link for details.